AMIT HERI (guitarist/composer): One of the few Indian musicians to perform at major international music festivals, Amit Heri has performed at the Berlin Jazz Festival, Montreux Jazz Festival, London Jazz Festival, Paris Jazz Festival, Rome World Music Festival & the WOMAD Festival. Amit has also scored music for feature films & dance theatre productions. 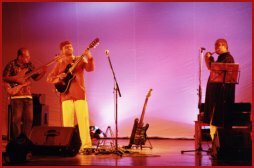 Drawing from various musical cultures of the world including Latin, Indian, Contemporary, Jazz, Funk, Blues and European music, the AMIT HERI GROUP performs original compositions that range from mellow and pretty, to fiery and funky. Tightly woven compositions interspersed with intricate improvisations in a high-energy performance make the AMIT HERI GROUP a uniquely enjoyable listening experience.